Implementing a pathways approach for college students is on the rise in higher education as institutions combat the persistent problem of low student completion. In general, a pathways approach defines an effective and intentional student experience based on data and best practice. For example, the American Association of Community Colleges (AACC) Guided Pathways Project has led many colleges to seek better definition along a student’s academic trajectory from enrollment to postsecondary completion. The same principle of defining an effective and intentional pathway can be applied to mathematics. Without clearly defined mathematics pathways, mathematics can serve as a barrier to student completion and success. This often occurs in four ways: 1) students flounder in developmental mathematics courses, 2) students do not pass their required mathematics courses, 3) students delay enrolling in mathematics courses, and 4) students enroll in mathematics courses that do not prepare them for their selected programs of study. When used effectively, mathematics pathways address these barriers. Evidence suggests that students, including those needing developmental support, can succeed in college-level mathematics courses with appropriate assistance. This support often is delivered through a one-semester co-requisite model or a one-year model sequencing each mathematics course in back-to-back semesters. Regardless of the model, student success relies on pathways that incorporate rigorous and relevant mathematics aligned to programs of study and informed by guidance from major professional organizations. Visit the Dana Center Mathematics Pathways (DCMP) resource site to learn about its history, vision, and four principles that guide the DCMP work. This guide is designed for faculty and staff at both two-year and four-year institutions that are implementing and scaling mathematics pathways based on DCMP principles. It offers a blueprint for implementation that spans four stages and ten essential actions. The stages frame the work so that different stakeholder groups understand how to plan and prepare to implement mathematics pathways at their individual institutions and how to monitor implementation efforts for continuous improvement. As seen in the graphic below, it is important to note that these stages and essential actions do not exist in isolation nor is the implementation process merely linear. Stages may overlap, and institutional circumstances may necessitate additional action to enact a stage. Further, some actions – Essential Actions 4, 5, and 8 – end for institutions after certain steps and activities are conducted; whereas, other actions – Essential Actions 1, 2, 3, 6, 7, 9, and 10 – are ongoing until normative practice is established. This comprehensive guide provides the most essential information and resources to begin and monitor implementation. It includes a collection of resources that can help build a customized implementation guide that reflects an institution’s specific needs. We recommend that institutional leadership teams review this online guide in its entirety before implementing mathematics pathways and also review additional information on the DCMP resource site. By providing an email address at the top left of the page, a user is able to save their progress, so that each time a user revisits the guide at a later date, progress can be continued from the last visit. 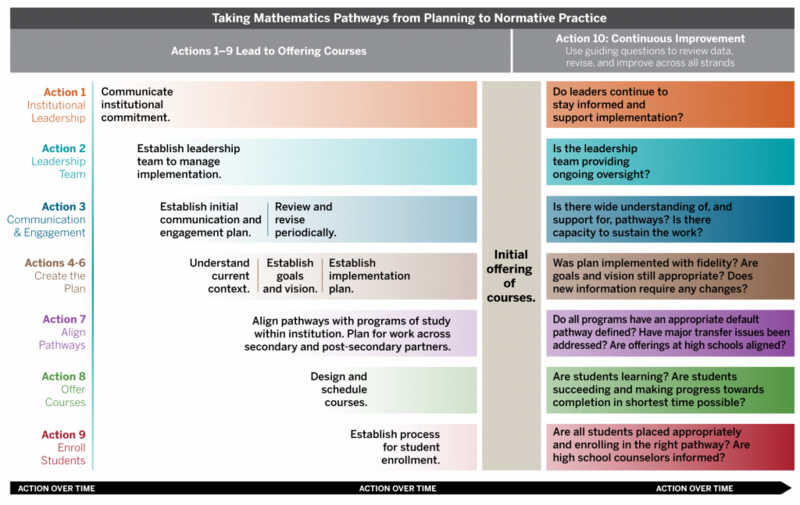 The Dana Center recommends a four-stage process and ten essential actions to implement and scale mathematics pathways to normative practice. We provide a brief description of each stage while its essential actions are outlined in the graphic below. Getting Started (Essential Actions 1-3) – leaders identify need, make commitment, and prepare to engage stakeholders through a leadership team. Planning (Essential Actions 4-7) – cross-functional leadership team collects and reviews data to define the problem and establish goals. Implementing (Essential Actions 8-9) – working groups and individuals follow the implementation plan under oversight of leadership team. Continuous Improvement (Essential Action 10) – working groups and individuals follow evaluation and communications plans under oversight of leadership team.